Fine... John Madden and Pat Summerall didn’t say those things, but that was an accurate recollection of one of the finest gridiron performances in the history of John Madden NFL ’93 for Sega Genesis. That game exemplified the true golden age of sports video games, which I have defined as beginning at the release of Nintendo Ice Hockey (c. 1988) to the release of NHL ’96 on Super Nintendo (date unknown). It was a lazy weekend day, and my friend and I had nothing better to do than sit down and devote ourselves to setting a record, albeit one that mattered little to anyone else. 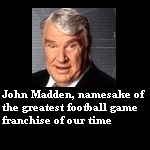 Madden ’93 itself was one of the true great ones. It was simple enough that you could find that one play that couldn’t be stopped (in Madden ’94 it was Barry Sanders’ HB Toss Right – it had to be banned during tournaments), but complex enough that it took you a while with the game to find that perfect play. The Madden franchise was not the originator when it came to football video games, however; that title belongs exclusively to Tecmo Bowl. The beauty of Tecmo Bowl was in its simplicity. Four plays on offense. On defense, you merely guess which one of the four plays the offense will run. No Nickel Double X Tiger Blitz packages, just Run 1, Run 2, Pass 1, or Pass 2. The gameplay was equally simple – run with the d-pad, throw with one button, switch receivers with the other. There were no fancy juke buttons (which are, in my opinion, the worst invention in the history of football video games); that’s not to say you couldn’t bust out the old Mighty Ducks triple-deke to break the ankles of any would-be tacklers. Tecmo Bowl, as ancient as it is, has remained one of the top “bored while at someone else’s house who only has Nintendo” games. Nintendo Ice Hockey, while not realistic whatsoever, provided one of the more enjoyable gaming experiences of the time. The point that separated Ice Hockey from the rest was the ability to pick your team from three different types of players: skinny, medium, and fat. It doesn’t take Barry Melrose to recognize that the skinny guys are fast, but they hit like a 5th string JV wide receiver (you know, the guy who came out just to get the yearbook exposure, and because he couldn’t make the soccer team). The fat guys never fall down, but move slower than, well, fat kids. The medium sized guys were probably the best overall, but the fat guys and skinny guys just looked goofier, so I always felt compelled to chose them. Blades of Steel was probably the second-best Nintendo hockey game of all time, for the sheer fact that, when you got in a fight, the loser got ejected and the winner got to keep playing – the way it should be. Super Nintendo hockey games were dominated by the EA Sports NHL ‘93-96 franchise. The games were solid, yet not spectacular. My greatest achievement in this series was dishing out a record 100 body checks in one game in NHL ’94 for Sega Genesis (this was done with that same friend, if you couldn’t guess). Baseball games were, in my opinion, better during the golden age than they are now. There were never more than two pitches to choose from, no little circles to hit with, no auto-fielding. You wanted to throw a slow pitch, you pushed up when you throw; you wanted a fastball, you pushed down when you pitch; you wanted the ball to curve, you pushed left or right to move the ball when it’s in the air (laws of aerodynamics do not apply). To hit the ball, you just pushed the swing button when the ball got close. Fielding-wise, the key was following the shadow of the ball and listening to the sound of the ball either rising or falling (I must claim the title of greatest golden age baseball video game fielder – I am still flawless on the routine plays, I make diving catches seem ordinary, and I am impeccable when it comes to turning double plays). The list of the top golden age baseball video games is stacked: Baseball Simulator 1.000, Baseball Stars, Extra Innings, RBI Baseball, Ken Griffey Jr. Baseball. But the greatest of all-time simply has to be Super Baseball Simulator 1.000, the Super Nintendo version of its aforementioned predecessor. (Editor's note: Roger Clemens Baseball easily holds the title of Worst Baseball Game of All-time) Baseball Simulator has become legendary for the “super” teams, whose players have the ability to throw such pitches as the stop pitch, the feather ball, the fire ball, and the super-super fast ball, which topped out at 188 mph. However, after years (sadly, I do mean years) of practice, I can hold my own against the super teams when I play with the regular teams. I once played 89 games of a season without simulating a single one during a summer. Just as I had taken over first place from the Heroes, one of the super teams, the game was improperly shut down and the season was lost – I very nearly cried. [Coach Krzyzewski mode on] I mean, playing Baseball Simulator season mode isn’t about winning championships, it’s about relationships. I loved those guys, Glen, Kirk, Peter, Sid... those guys gave it all they had every game, and I just feel for them. [Coach Krzyzewski mode off]. That Boston team still stands as the greatest regular team ever assembled in Baseball Simulator history. Those days are past us now. Sports games are still fun, although I sometimes spend all my time in the absurdly detailed instant replay modes. The golden age of video games was different, though. Games somehow meant more, and despite the fact that they were less realistic, I was able to take them more seriously. Video games weren’t just a hobby, they were an addiction... holy crap, did I just say I was addicted to video games? You never read that. That sentence did not happen. I AM NOT ADDICTED TO VIDEO GAMES. YOU HEAR ME?! NO WAY... but they were really fun.